We always search for a moment when we can relax, forget about our worries, and just breathe. Most people have different interests; but those who are interested in getting a luxury out of their car ride, this is the perfect opportunity for them to get started on this venture. Travel cars are needed by people to travel around their places of concern. Sometimes these may consist of ordinary use of cars. However, the best feeling is when you are sitting in a well-furnished limousine. So if you are planning to attend a special event, take support from Limousine Service DC special car assistance. The love for traveling is encouraged by us and we cater to the needs of people who want a vehicle for their airport services. Get vehicles at the highest quality and the most affordable rates. It will be nothing like you have ever sat in. It is obvious that you would need to carry heavy luggage along, while going for any kind of trip. It is not possible to fit all the supplies in a small car. Therefore, the spacious cars we offer can change the way you travel. You can very easily pack any stuff you want to take with you. We provide you the one of its kind travel guidance with Limousine Service Dc. Our dedication to provide customers with airport transportation with a perfect vehicle helps us become one of the largest businesses in DC. High-class chauffeurs will drive you around the city for your important meetings, legal conferences, and corporate gatherings. You need to look professional at all times and dress immaculately so that you may be presentable. A formal dress code requires one to be dressed in suits, tailored clothing, and a neat personality. Therefore, it is necessary to book a special car for traveling around in these events so that your clothes are not ruined. You will not have to worry about reaching late or arriving unprepared. The exclusive team of Limoservicedc.com will satisfy your demands. You would not just have to order a vehicle and get ready to drive around with the best fleet of Limousine Service Dc. Whenever you need a night full of surprises, gather your friends and book a limousine. This is not an ordinary car rental service for immature people; it is a ride with professional that you will remember for the rest of your life. So if you are in a mood to party, then brace yourself for the party everyone will look forward to. Choose the party vehicle, which you like the most. Some great rental options for a fun filled group of friends party includes the 14 Passenger Excursion Limo, 16 – 42 Passenger Party Bus, 40 Passenger Mega Party Bus and the 15 Passenger Stretch Hummer Limo. All of these are great vehicles for comfortable and spacious traveling needs. Whether it is a birthday party, or a wedding occasion, you can easily get a ride for any event. You will not have to miss a party again because of transport issues. 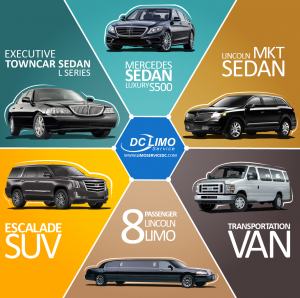 If you do not have a car of your own, or need a special private car, then refer to the elite services of DC Limo. People in Washington can gain so much from this facility. They will never have to worry about booking transport and going to places, they like. Celebrate your special days with the support of the greatest company online. Just have all your party supplies ready and create a fun filled experience out of it. Get easy access to pick and drop services, and that too in the coolest cars you will find. We make sure that our Limousine Service Dc helps you get relax, and have the best time off from work or your boring routine. Get a fancy wedding limousine, a party bus, a stretch limo for prom, a hummer party limo, a black corporate limo or a comfortable Mercedes. The events are called ‘occasions’ because they occur at rare time of the year. It is not every day that you attend a wedding or go for a corporate event. Our extraordinary service helps customers in their individual problems and makes them look royal and important in front of other people. Trust us with your personal events and we will help you make it a success. Customers will not even have to spend lots of money for purchasing their special ride. We offer discounts, which are availed by people who want to gain something extra from their shopping experience. Book the all in one package for yourself through Limousine Service Dc. This will comprise of elite class options such as getting a premium chauffeur driven facility and a great overall wonderful party transportation.